03.15.16 :: Categories: Don't Frack with New York and Fracking/Gas Drilling. On February 22nd, the New York City Council Committee on Environmental Protection held a very successful hearing on Int 446 banning the discharge, disposal, sale or use of fracking waste in New York City. This bill should become law. We now need your help to increase the number of Council members sponsoring the bill and to get it out of the Environmental Protection Committee and onto the floor of the City Council. Fracking waste can contain pollutants such as chemicals, metals, excess salts, and carcinogens like benzene and naturally-occurring radioactive materials. While New York State has banned high-volume horizontal hydraulic fracturing, the state still has thousands of conventional, low-volume oil and natural gas wells. New York allows deicing and dust control on roads with certain kinds of waste from oil and natural gas wells and storage facilities. In addition, Pennsylvania oil and gas extraction operations have sent more than 510,000 tons of solid waste and 23,000 barrels of liquid waste to New York landfills for disposal. The liquid material that drains from the landfills, known as leachate, is then sent to nearby wastewater treatment facilities. So far 15 other New York counties have passed bans on road spreading and/or disposal of fracking waste. We need your help to urge NYC to join them and ensure that this toxic waste is never used on City roads or allowed to pollute our environment. Please click on Int 446 to find out whether your Council Member is a sponsor of this bill. If not, please call your Council Member today. You may click here to find your Council Member. Increase the penalty for non-compliance from the current $100 per violation to at least $25,000. A $100 fine is not a deterrent. 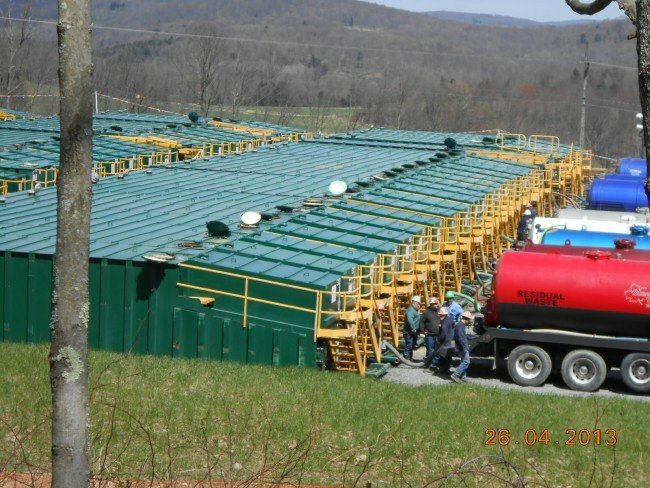 At least 11 counties in New York State have included a penalty provision in their fracking waste bans that provide for a fine up to $25,000 per violation. The definition of waste should not be limited to only waste from natural gas extraction activities. It should include all relevant forms of oil and natural gas waste, including waste from oil and natural gas storage.